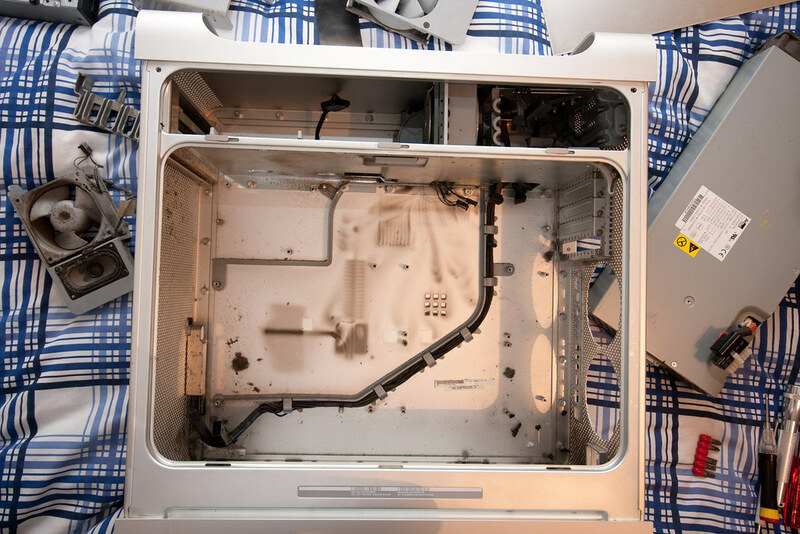 The first challenge was removing all the Apple parts in the case. Some parts were held in in very weird and peculiar ways. All the screws were different for each component, which made it a pain to remove some parts. Most screw heads were Phillips, but some had Hex and Torx heads which luckily and I had the right size screw bits. The first parts to come out were the CPU heatsink and fan. The heatsink was heavy and absolutely massive. I could now see all the screws holding the motherboard in place. There were a few cables to disconnect for the power, front IO, fans and hard drives, once these were removed the motherboard lifted out relatively easily. I could now access the power supply in the bottom of the case. Again this was relatively easy to remove as it was only held in by a few of screws, however there are 4 to remove from the underside of the case. The Mac PSU is strange in that it covers the whole bottom of the case, but in doing so it is relatively thin. I then hit a problem in that I couldn’t reach some screws that held the hard drive cage in place.